If you own the iCare mod by Eleaf, you are going to know all about the care free functionality that it provides you with its design that is designed with a travel friendly size as well as convenience in mind. These mods are able to capture your heart very quickly with just how easy that it is to use and it is a fantastic choice is you are after a mod that is going to be able to keep up with your vaping needs and fit into your lifestyle with an ease and elegance that is incomparable. Irreplaceable within your collection, making sure that you always have those few essential accessories in case you need to make a quick fix is going to be essential to keep you happily vaping all day, every day without anything getting in your way. Eleaf is one of those brands who makes just about everything that you could ever want or need to put together your vaping device, they are very well known and loved within the industry for their innovation and exceptional quality that is very evident from the very moment that you get any of their products into your hands. This listing is going to provide you with a replacement cartridge, coil and mouthpiece that is going to have you prepared and with a peace of mind that leaves you with an even more relaxing and self assured vaping experience. The cartridge has an impressive juice capacity of 2ml and the coil has a resistance of 1.3 ohms that is going to be just what you have needed to keep on making those big, fluffy clouds that make your eyes light up with joy. 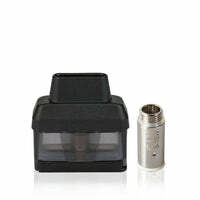 iCare Replacement Cartridge and Coil - Eleaf has a rating of 4.5 stars based on 2 reviews.